Welcome to my blog. I have been meaning to do this for some time so now--right now--I'm doing it. I hope to accomplish a following of fans that appreciate my comments as well as comment on what I blog. I am a writer and swim in a variety of pools, lakes, and streams. I trust my subjects, themes, and ideas will educate your perception. The Mind Is Sorry The Body Suffers 2011 Author House (Poems and drawings. This is my first published book of poetry and drawings. You can purchase my books on my website, Amazon, and Barnes & Noble. I write suspense fiction novels. Reviews of my books are at links to this site, bottom of this blog, or on my website. Grew up in Rockford, Illinois; raised Catholic; graduated from high school; traveled out west and found myself;lost myself;found my wife of thirty years in Durango, Colo.; adopted two girls and raised them; lived in a haunted house; lived in southern Mississippi,Idaho,Arizona,Colorado, in my car, in a tent, on the beach, on the road; hitchhiked often; played baseball and dreamed of playing for the Chicago Cubs; recorded music and tried to sell it, but failed; was a bum, street musician, resort worker, unemployed, laid off, fired, preacher, tree trimmer, missionary, farmer, gardener,laborer,janitor, cook, cabinetmaker; broke a collar bone falling off a picnic table, broke my right ankle falling down the stairs, I space out often and dream. I like to listen and write novels. It was a very fun-loving book. I liked how the author put together the different situations Jay Bird and the other characters encountered on the road and how he made you see that these life experiences helped the characters grow inside. I would recommend it! More want to hug him and other times you get so angry at him for being such a jerk. Anyway if you like quirky humor, armchair philosophy with some adventure then you'll like this book. A good coming-of-age road story of adventure with a variety of experiences-some silly, others strange and dangerous. I found myself wondering what sort of people Jay and friends were going to meet inside the next car. The author does a refreshing job using descriptive words to express a range of emotions and situations-love, fear, freedom, sorrow- and not much profanity. This book is a good read. The author keeps you interested in Andrew's life and makes one wonder if he will ever have anything good happen to him. There is quite a lot of suspense going on within the book. I truly enjoyed reading it. A Higher Court by John L. Betcher. This entertaining and thought provoking read will appeal to readers from all denominations, to those unsure of their faith, and even to those who consider themselves atheists. John L. Betcher doesn’t preach or push his own beliefs on his audience. His research is intensive and he presents the facts and his findings for the reader to decide. A Higher Court will definitely have you considering or reconsidering your thoughts on God. This book is well written in every aspect. It caught my interest early, and kept me hooked with insightful information, crisp dialogue, and then finally, an ending I didn’t see coming. I can’t imagine anyone reading A Higher Court and not feeling moved to recommend it to a friend or family member. I asked my wife to read it. 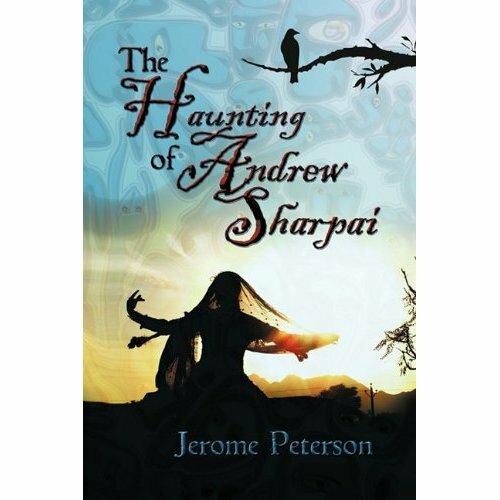 The Haunting of Andrew Sharpai by Jerome Peterson Author Jerome Peterson has crafted an extremely entertaining novel. The characters are well developed, especially the hero/drifter Andrew, and the strong, mysterious yet vulnerable Iris. The quirky and intelligent Lily adds a humorous touch without the precociousness so often seen in young fictitious characters. The Haunting of Andrew Sharpai cast a spell on me—I couldn’t stop reading until I knew how it turned out. Suspense, a fast pace, plot twists, romance, wacky animals, and family bonds make this one of the best books I’ve read in 2010. 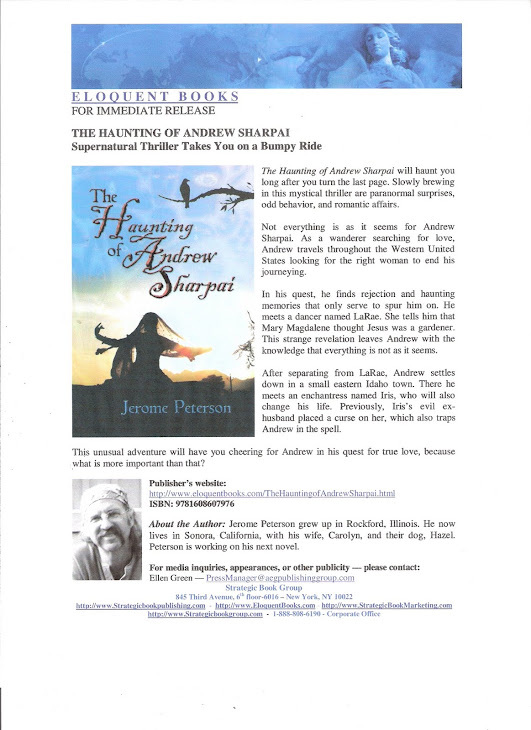 If you enjoy a great paranormal thriller, The Haunting of Andrew Sharpai is a must read! Wow. You've got to read this book. The characters bring you in and won't let go. If you're easily spooked, don't read the last half at night! Finally, a book written from a male's perspective that women can enjoy, too. Great book, highly recommended. One lost love will prepare one for another. "The Haunting of Andrew Sharpai" tells the story of American wanderer Andrew Sharpai in a search for love. Finding and losing it, he learns a lot along the way as he finds his newest challenge, an enchantress and finds himself at the mercy of a curse that may finally end his travels. "The Haunting of Andrew Sharpai" is a fine pick for anyone looking for a for a riveting novel of love and loss. Description: All Andrew Sharpai wanted in life was to find true love. Wandering around the Western United States, he searches for that missing love only to find rejection and haunting memories. Along his journey, he meets LaRae DuFont, a famous show dancer, who tells him a story in which Mary Magdalene thought Jesus was a gardener, teaching Andrew that not everything is as it seems. This lesson will change his life forever. An uncontrollable twist of fate separates the two lovers and leads Andrew to wander again. He finally settles in a small town in eastern Idaho where he encounters the notorious enchantress, Iris Winkle. However, her ex-husband has placed a fiendish curse on Iris and Andrew soon finds himself trapped within the enchantment. Remembering the lesson LaRae taught him may be his only salvation, but will it be enough to save him from the perilous spell. What I Think: I was able to review Mr. Peterson's first novel Thumb Flagging (Read my Review). Thumb Flagging was a wonderful adventure book so when I was contacted to review his second book I was glad to read it. The Haunting Of Andrew Sharpai is the authors second novel. I have to admit that I thought the second book would of been an adventure book like the first one. I would call it an adventure, paranormal, and Paranormal romance novel. Some authors just stick to one theme and continue all their novels with it. I am glad that Mr. Peterson has not. This was well written and kept my attention all the way tell the end. The character descriptions made it possible for the reader to get to know each individual. I am very impressed with this author and I can't wait to see what other books he will write. Jerome Peterson grew up in Rockford, Illinois. 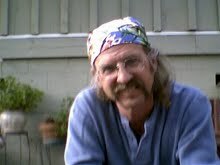 He now lives in Sonora, California, with his wife, Carolyn, and their dog, Hazel. Peterson is working on his next novel. The Haunting of Andrew Sharpai will haunt you long after you turn the last page. Slowly brewing in this mystical thriller are paranormal surprises, odd behavior, and romantic affairs. Not everything is as it seems for Andrew Sharpai. As a wanderer searching for love, Andrew travels throughout the Western United States looking for the right woman to end his journeying. In his quest, he finds rejection and haunting memories that only serve to spur him on. He meets a dancer named LaRae. She tells him that Mary Magdalene thought Jesus was a gardener. This strange revelation leaves Andrew with the knowledge that everything is not as it seems. After separating from LaRae, Andrew settles down in a small eastern Idaho town. There he meets an enchantress named Iris, who will also change his life. Previously, Iris’s evil ex-husband placed a curse on her, which also traps Andrew in the spell. This unusual adventure will have you cheering for Andrew in his quest for true love, because what is more important than that? I'm so glad I finally read this beautiful told story. I hate to admit, in the beginning I wasn't sure where it was going to go, but it came together profoundly. I am quite impressed with the author's way of telling a story, where I felt myself asking those questions that were asked. There was a beautiful moral to the story that should be learned more of, and this was a great way of doing it. Love each other on the inside. The outside is not who we are, it's a shell of a masterpiece. That's what I took from it. Beautiful, right?! I'm surely adding to my recommendation list! Oh, that's a wonderful moral and so true! I must say the cover caught my eye as well...interesting choice. Thanks for sharing...and happy reading! Sounds good. The cover is definitely compelling. This is why I love my fellow book bloggers! The blurb would never have been enough to interest me in this one, however, your review makes me want to know more! Heading over to Good Reads now to see what's what! The cover on this one really caught my attention. The synoposis makes it sound okay but your review did the trick. I will check this one out. Iris was a Wiccan witch and was actively involved in her religion . Her daughter was named Lily and Andrew was drawn to these two "flower girls" But after they became involved, Andrew was attacked by something that he could not see... As he talked to Iris, he learned that her Ex was a follower of Satan and that he had come back and wanted to get back together with Iris and Lily. Iris placed a protection spell around them, and even decided to relocate, talking Andrew into going with her. She also admitted that she had formerly been of her husband's religion and he now wanted his daughter to be the same. mystical Raven are all there for the taking in this compelling paranormal thriller. as a cook in a high-end casino, where he meets a beautiful dancer named LaRae DuFont. and LaRae tells Andrew the story of how Mary Magdalene mistook Jesus for a gardener. Despite Andrew’s atheist ideal, he takes to the lesson that not everything is how it seems. soon drifts from Vegas to Pocatello, Idaho. he wants Lily. Iris refuses and Devon castes a frightening powerful spell on the new family. to his old ways of running from it all. 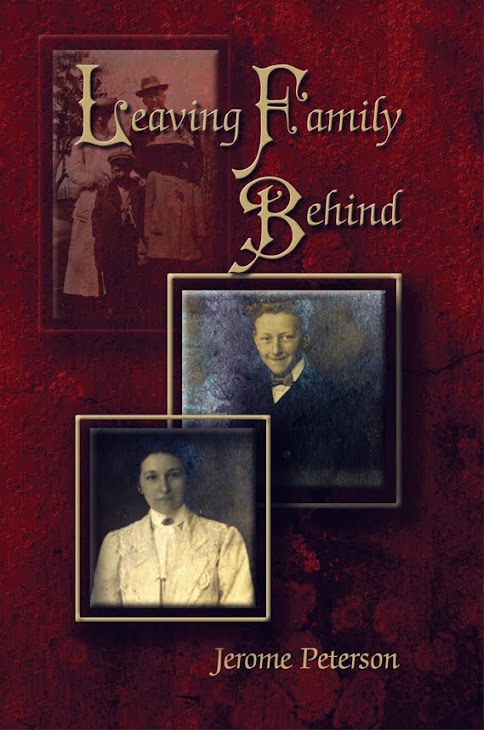 I was delighted when Jerome Peterson contacted me recently and broke the news that he had another book published. His first book Thumb Flagging was a glorious tale about hitch hiking in the 70’s. I found it a nostalgic work that took me back to my youth. I knew nothing about his new book other than the title The Haunting Of Andrew Sharpai until it arrived in my mail box. If I was expecting a continuation of Thumb Flagging I was way off base. This book is a very different animal. It is a book that has several facets to it. In part is a love story, in part it is a study of human nature and introspection, and in part it is a paranormal thriller. This might sound like a strange combination yet Jerome Peterson carries it off flawlessly. We meet Andrew Sharpai in Las Vegas, he is cook by trade and a nomad by circumstance. His life seems to consist of a series of failed romantic interludes that all ended in such a devastating fashion that a change of city and state were called for. Andrew has just ended a grueling shift, too tired to go home and change clothes he opts to sit in the hotel bar and find some solace in the bottom of a glass. Instead, he encounters a strikingly good looking black lady LaRae DuFont, a much sought after Las Vegas dancer. A love affair blossoms between this unlikely pair. I have to say that I was really impressed with the angles that Jerome Peterson explored in this segment of the book. Even though we live in the 21st century mixed race relationships are still a subject of discussion. My mother was by no means a racist, yet I can remember a conversation we had when I was about 15, “I don’t care who you marry, as long as it is a white girl”. Andrew Sharpai’s happiness is short lived, a fatal car crash ends the relationship. Vegas now has too many bad memories and our nomadic hero moves once again.With no clear destination Andrew arrives in Pocatello, Idaho. Lost in a sea of drunken depression he fritters away his remaining money. Driven by need rather than desire he takes a job way beneath his capabilities, a line cook at he local Denny’s. It does however mark the beginnings of a new Andrew Sharpai. His world changes once again when he encounters Iris Winkle. With facial scars she is well known in the area as a satanic witch. Is she? Or is this a case of people just creating a legend? You might think that I have given away too much of the plot but I have not. I have merely summarized the first 30 pages! There are another 270 left for you explore! The Haunting Of Andrew Sharpai is well worth reading. I am beginning to get the sense that Jerome Peterson is a name that is going to start appearing on those coveted best seller lists. He writes with authority and knowledge. This is not a novel that has just been thrown together, it has been skilfully crafted. I am no expert on the use of language, but I do know when it is well done, and this book is a clear example. I will be interviewing Jerome in the near future and I have to say that I am looking forward to it. 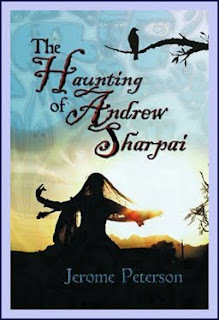 You can order your copy of The Haunting Of Andrew Sharpai from Amazon by clicking the link above. Thumb Flagging doesn't sound like a book I would of picked out to read and do a review on... I didn't know if I was going to enjoy this book about the open road hitch hiking across the country, how could this book be full of adventure like the books I like to read. Well my blog is about worlds of books so I keep an open mind about the books I read and when the Author Jerome Peterson contacted me about his book I thought why not... Can't find out if a book is good until you read it. I am so glad that he contacted me because I would of missed out on a great adventure. Two friends Willy Jacobs a free spirited and confident individual and Jay Paterson a kindhearted, easily taken in who has many issues he would like to over come hit the open road. Thumb Flagging (Hitch Hiking) traveling the open road by thumb fuel and riding the rails is a way Willy thinks would help Jay over come his issues. They meet many people along their journey and have to over come, face and deal with many situations along the way. One in particular that Jay breaks his promise and rats to the police over. This later leaves him scared, fearful of himself, friends and loved ones. I really enjoyed this book it is full of adventure, suspense, fear and happiness and yes even a little romance all of the things that I like. Even though this book is out of what I would of normally picked up to read it was enjoyable and well worth the price of the book. The Author has written this book in a way that it is easy to read. What is Thumb Flagging? In a word, Hitch Hiking. In many ways a long lost art. As a teenager in the 60’s and early 70’s it was my preferred mode of transportation. In the summer a couple of us would hit the tarmac heading off to one music festival or another. A bedroll, a two man tent, and the wind in our hair. The funny this was, we never had any money, yet somehow we never went hungry or thirsty. Oh the glorious days of being a hippie! It is funny how times change, when my kids became teens I would have become unglued if they had repeated my performances. Is it that I have changed, or it that the world has changed? I for one would never dream of thumbing anywhere today. Jerome Peterson does not give us many clues as the the time period that Thumb Flagging is set in, but I am guessing it is sometime in the 1970’s. As soon as I laid eyes on the cover I has a feeling that this was going to be a book that I was going to enjoy. In fact I picked it up and told my wife I was just going outside to smoke a cigarette and glance at the first couple of pages. Well 4 hours and 220 pages later I came back in. “That was a long cigarette”, my wife sarcastically remarked! Our hero is Jay Patterson, a mild mannered young man, who learns the joy of the open road from his nomadic drifter friend Willy Jacobs. As the pair travel, Jaybird, as Willy christens him, learns the art and myths of conquering the ‘concrete diva’. What a great term ‘concrete diva’, it is these little phrases that are scattered throughout the book that really drew me in. Jaybirds first journey is from Phoenix, Arizona, to Malibu, California, their destination, to look at Bob Dylan’s house, and maybe even meet the great man. This odyssey is more than a mere road trip, it is a journey of self discovery, and discovery of others. Nothing quite beats the intimacy of strangers. People tell you the most bizarre personal things in the knowledge that they will never meet you again. Hungry and in need of a place to stay Willy reaches deep into his ‘roadsmithing’ bag of tricks and introduces Jaybird to the world of the church mission. A place where a hot meal and a warm bed can be found. When I read this part of the book, I reflected back to an occasion in 1970. I had Thumb Flagged some 200 miles in order to see one of my then (and now) favorite musicians Al Stewart, or, as he is known in our household $90 Al (leave a comment and I will explain). I had enough money to buy a ticket for the weekend festival, but none for food! I spent the weekend alternately being fed bean stew by the Hari Krishna people, and being saved by some kind hearted Christian Youth group who at least had meat in their meals! Willy is a born nomad, and takes off for Maine. Jaybird, bored with Phoenix and having roots and responsibilities, decides to take to the road once more, this time to find the wandering Willy. Along the way Jaybird finds a kindred spirit in Chloe, a young lady who offers no past, an enigmatic present, and an uncertain future. To share more of the plot would spoil this richly satisfying read. I will say that there are some subplots, that are interesting, and as a retired road warrior myself, I once again found myself floating back to my own experiences. Thumb Flagging makes for a wonderful read, Jerome Peterson has done an outstanding job on the character and plot development. We meet the young neophyte Jay Patterson, and end knowing the worldly wise Jaybirdy! 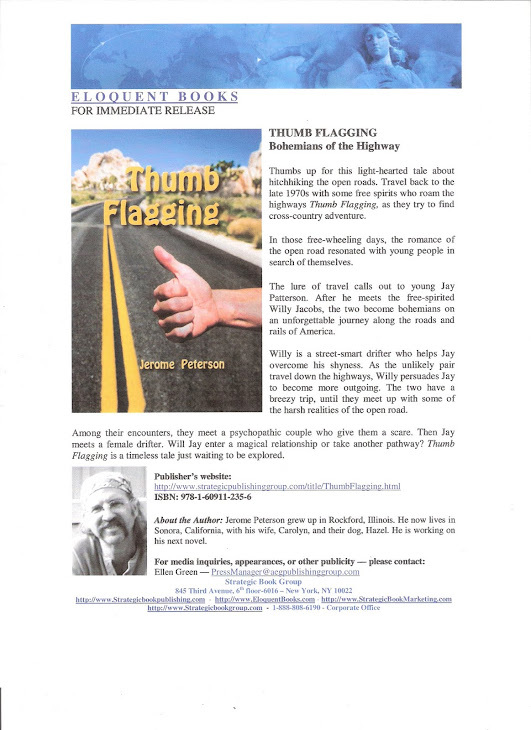 Thumb Flagging is available through Amazon, Jerome also has a web site. Thumb Flagging and perhaps get yourself your next great read! lead them to extraordinary situations beyond their imaginations. uses his strong personality and energy persuading Jay into becoming a hitchhiking junkie. and the harsh realities of the open highway. cross the path a number of times with a mysterious psychopathic couple. Gardener, and he is preparing a poetry manuscript and a book of short stories." Now onto the giveaway, which is now closed, with the winner being notified. Thumb Flagging, Signed by the Author Himself!!! Answer me this: If you could hitchhike anywhere, where would you go? and I thank you for it, but you'll only get the +10 once). Also please leave a link! along a phone or a netbook so you can follow Jerome and me all this week! his crackerjack friend that the time is right for him to learn the ways of the concrete diva. multitude of cars that pass them, Willy imparts his knowledge and experience to Jay. jaunty move it looks like a flag blowing in the breeze... and Thumb Flagging is born. the open road once more to while away their three day suspension. cops because Sykes would know it's them. Jay breaks this promise. detachment that Willy taught while they traveled this great land? spouting traveler, it wasn't until Jay's journey that I became invested in the characters. Nanook and Jay shows the quality of person he is. part of their lives. For those who would never or those who have this book is a great read. where the road might lead as passenger or driver. Question: How autobiographical is Thumb Flagging? Answer: Maybe ten percent; maybe. Question: For the clichéd question, what made you decide to become a writer? that impressed me with inspiration. I said to myself, "I can do that". Question: Do you hold the same regard as Jay does for Bob Dylan? me. Whatever he has to say, I listen. time period right? Or was it from your own experiences? great one for having odd sayings. then our overprotected isolated lives we now lead? Answer: Yes and no. I think it depends on the state or states you are traveling through. people are hitching and letting followers know what's happening through their blog. adventure, hitchhiking can live up to all of that. Question: How is does the feeling of riding the rails differ from hitchhiking? location do you get seized by wanderlust and just have to move on? usually hits when warmer weather rolls around. detach from hangups and prepare for experiences that had inspiration and hope. takes? Or is it just an inevitable downside? are not. Hitchhiking tells you up front there is no control, it's all a genuine gamble. much as they are in front of their computer screens surfing the internet. anything from his namesake in Oliver Twist? traits of both are purely coincidental. out like you think, with no explanation to boot. Question: Could you ever see yourself continuing the story of Jay and Chloe? Answer: Yes, that is possible. Question: What are you currently working on? immigration, and the tragic affects of bitterness, ignorance, and regret. diva.... so let's hear it for.... Callie! for the holidays, or any time really! Have a wonderful week and a Merry Christmas! road to find themselves in a criss-cross America journey. We meet Jay Patterson. Jay was raised Catholic, is the youngest child of six, and the only son. date with the Concrete Diva. When Willy learns that Jay has a sister in Colorado, it is decided. “Thumb Flagging.” With each ride, they meet another in an eclectic assortment of characters. with a huge hunting knife all add to this wondrous first journey of personal discovery for Jay. drop-in at the sister’s house leads to a wild night of drinking with ‘the sis’ and husband Bernie. At the beginning of Part Two, Jay’s confidence is still soaring high after a successful first trek. passage stories, and travel fiction. Thumb Flagging touches our primary emotions: anxiety, fear, sadness, wonder, joy, and love. Willy is a seasoned hitchhiker who introduces Jay to the wonders of the open road in order to boost his self-confidence and rid him of his spoiled-Catholic-boy tendencies. I enjoyed this. As you can imagine in a book about hitchhiking, it's a bit of a picaresque novel with stories about the other hitchers and rides they catch. There were some interesting stories, some crazy stories, and some unexpected stories. Some of the people whom I stereotyped based on their descriptions had surprising insights or tragedies to share. Jay finally realizes that everyone he meets has something to teach him and he starts to actively think about it and seek out the lessons. I like it. I did enjoy the second half a little more, when Chloe was introduced. She was a great character! Tough, vulnerable, funny, she just brightened up the book for me. And Nanook! If I had a dog, I would want her to be just like Nanook, one of the best dogs ever. This really could just be read as a story of two young men hitchhiking around the country and the characters they meet, but there's more to be learned than that. Jay identifies his weaknesses and learns to try to grow past them, recognize them when they show back up, and keep fighting those tendencies. Willy learns that you can't just ignore your problems; you have to face them or they'll lead to even bigger problems down the road. They both learn to appreciate good traveling companions while you have them, but gracefully let them go when it's time to move on. There were a couple of plot lines that were left unresolved, so I'm wondering if there will be a sequel. The book feels pretty complete on its own, but if there is a sequel, I will check it out and see how Jay, Willy, and company are doing. I recommend this. I think it would be a good crossover novel for young adults too. Jay is in his twenties, but he's really just coming of age. Just be warned that this will have you ready to hit the road! Thanks to the author for providing me a copy for review. Take a look inside the book on Amazon. Find author Jerome Peterson on his blog, Twitter, and Facebook. Without getting into details, I hitch hiked 1200 miles once. Maybe wasn't the smartest thing I ever did, but I made it. This books appeals to me unlike no other. Great review! I would imagine a book about hitchhiking can take you to a lot of different places. yikes...i'm such a scared-cat that i wouldn't take a ride from anyone! i know that my dad hitch hiked back in the 60s but being male and the era made it a bit different, i think. glad you enjoyed this one--maybe it sounds a bit reminiscent of 'on the road'?